Petrochemicals – components derived from oil and gas that are used in everyday products such as plastics, fertilisers, packaging, clothing, digital devices, medical equipment, detergents and tyres – are becoming the largest drivers of global oil demand, in front of cars, planes and trucks, according to a major study by the International Energy Agency (IEA). 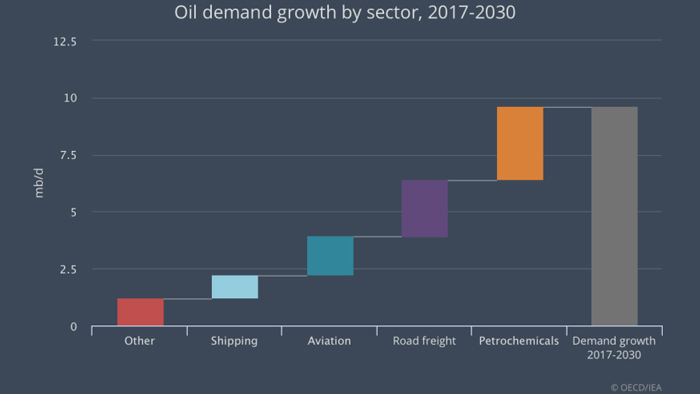 Petrochemicals are set to account for more than a third of the growth in world oil demand to 2030, and nearly half the growth to 2050, adding nearly seven million barrels of oil a day by then. They are also poised to consume an additional 56 billion cubic metres (bcm) of natural gas by 2030, and 83 bcm by 2050. The “Future of Petrochemicals” is part of a new IEA series shining a light on “blind spots” of the global energy system – issues that are critical to the evolution of the energy sector but receive less attention than they deserve. The report is among the most comprehensive reviews of the global petrochemicals sector, and follows other reports in the series, including the impact of air conditioners on electricity demand, the impact of trucking on oil demand, or the role of modern bioenergy in the renewables sector. The dynamism of the petrochemical industry is also driving new trends around the world. After decades of stagnation and decline, the United States has re-emerged as a low-cost location for chemicals production thanks to the shale gas revolution, and is now home to around 40% of the global ethane-based petrochemical production capacity. Meanwhile, the Middle East remains the lowest cost centre for many key petrochemicals, with a host of new projects announced across the region. The IEA’s “Future of Petrochemicals” report was developed with input from governments, industry and other key stakeholders, and seeks to bring the sector the attention it deserves in the global energy policy debate. It also provides 10 key policy recommendations to build a more sustainable and efficient petrochemicals industry.